North Mine Cottage is located in the centre of Herodsfoot. The property is situated opposite the village green with its own private garden and off street parking. With 2 upstairs bedrooms the property comfortably sleeps up to 5 people and would particularly suit a family with children. Pets are welcome. In addition the property has a separate games room in the garden and the self contained garden is suitable for dogs. Bookings also accepted through Airbnb with no booking fee. I live in Cornwall with my wife and 2 children. We recently bought North Mine Cottage due to its proximity to our house. We love the village of Herodsfoot and hope that you will too if you choose to book. 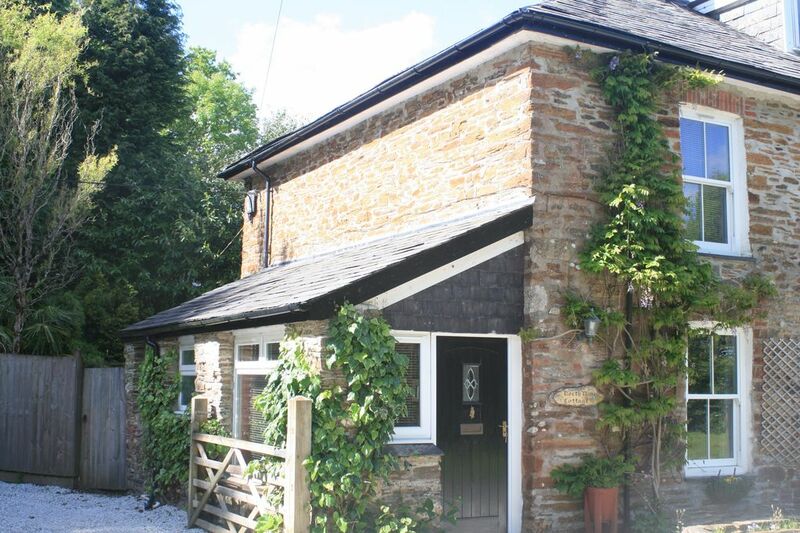 We recently bought the cottage due to the fact that its garden adjoins ours making it an ideal investment. Having lived in the village for many years, we love the local area and hope that you will visit Cornwall to enjoy all that it has to offer. Set in a quiet Cornish village, you can access beautiful countryside walks from your doorstep. Ideal for dog walking and enjoying the countryside. The cottage is an old mining cottage looking out onto the small village green. Downstairs bathroom with wc, sink and bath with electric shower. There is a wood stove in the lounge which guests are welcome to use. We provide a starter pack of wood and matches. Lounge with 2 double sofas, large fireplace with wood burning stove, television with dvd. The cottage has a Range, providing both hob and oven facilities. Pots, pans and other cooking utensils provided along with plates, cups, bowls, cutlery and various other kitchenware. The kitchen includes a dining area with space to seat 5 people. A high chair can be provided on request at time of booking. The Games Room has a table tennis table. The following golf courses are within easy reach of the property: St Mellion (16 miles); China Fleet County Club (18 miles); Lostwithiel Hotel Golf and Country Club (10 miles); and Looe golf club (7 miles). Outside: The garden has a charcoal barbecue, table and chairs, outhouse for washing machine and games room. Cleaning / Towels / Linen / Maid service: Towels and linen are provided. The property is cleaned prior to arrival. Clean towels are provided once a week. Other: Entrance hall with hall table and comfortable chair, coat hooks and shoe storage. The outhouse to the rear of the property houses a washing machine and freezer. The rear garden also has a separate games room. Had a lovely long weekend stay with 2 children and 2 dogs. Nice touch to have Easter cakes and Cadbury’s eggs for the children. Would definitely recommend staying. Loved the traditional feactures of the cottage! The nearby coastal town of Looe is situated 13 miles from the village. The historic twin towns of East and West Looe provide all you could ask of a holiday in Cornwall. Safe beaches, a wide choice of restaurants, excellent walking routes, fishing trips, diving, etc. Nearby beaches include Talland Bay (9 miles by car) and dog friendly Lantic Bay (10 miles by car). Newquay, Padstow and the Port Isaac (made famous by Doc Martin) are on the North Cornwall coast yet are only 40-45 minutes drive. Use of a car is essential. Herodsfoot is situated just over 4 miles from Liskeard Railway Station (with direct rail links to London, Birmingham and the North); 30 miles from Newquay Cornwall International Airport; and 67 miles from Exeter International Airport. The nearest town is Liskeard which is a few minutes drive where an array of shops, banks and supermarkets are available. Plymouth is a 25 minute drive and can also be reached by train from the local station. There are many National Trust properties and historic places to visit in the local area including Lanhydrock House at nearby Bodmin (10 miles). The Deerpark Forest is within walking distance of the cottage with its forest trails and on site café. There are a range of restaurants within easy reach of the cottage. Lunch or dinner at the Plough Inn at Duloe will be one of the highlights of your holiday. This is a traditional Cornish pub that just happens to have an award-winning chef overseeing a delicious menu that will get your taste buds tingling. We recommend fish night on Thursdays with fresh catches of the day from Looe on the menu. Just a ten minutes drive through the lanes from the cottage. Also close by are the pubs and restaurants of Looe, The Jubilee Inn for Sunday lunch at Pelynt (6 miles) and Trewithen restaurant in Lostwithiel (10 miles). The world famous Eden project, home to over 2 million plants, is just 18 miles away in St Austell. For the more active, Adrenalin Quarry and Kart World are just 7 miles away at Menheniot. Adrenalin Quarry offers the opportunity to try coasteering, flying down the UK's wildest zip wire or swinging off a cliff on a giant swing.